Join us for a relaxing fire as we make S’mores and put our feet up to the cool Smoky Mountain air. S’more, coffee, and cookies will be provided. We will talk about the activities and hikes throughout the week. Drive by motorcade to Twenty-Mile Ranger Station where we will hike approximately 4 miles to the first shelter and back. Those wanting a more difficult hike can go to Historic, but overgrown, Dalton Gap and bushwhack down the mountain to Wolf Ridge Trail and out to Twenty Mile Ranger Station. This option is roughly 5 miles. Meet at the Dogwood Suite for a presentation on butterflies by our resident naturalist, Kris Light. 9:00 am General Store Joyce Kilmer Drive by motorcade over to Joyce Kilmer Memorial Forest and hike the two-mile loop to enjoy carpets of wildflowers in this true wilderness area. Spring in the Smoky Mountains at its best at this remote location of the Southern Appalachians. Those wanting a more strenuous venture will take up Stratton Bald Trail to Rattler Ford Bridge. This option is approximately 5.5 miles in length, mostly downhill. 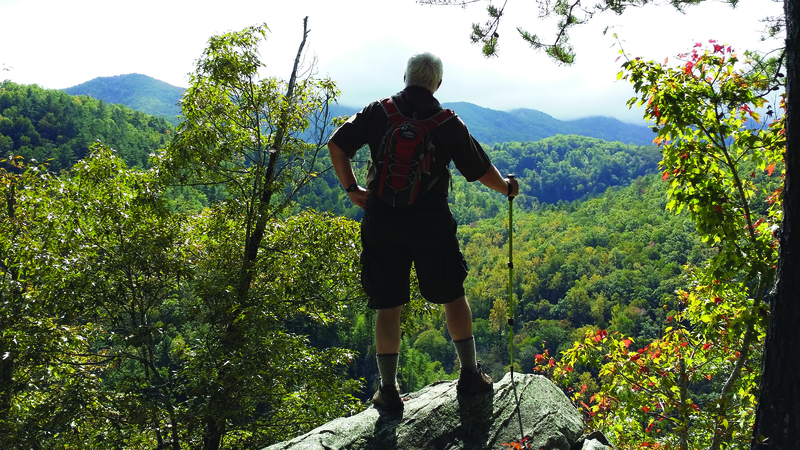 Meet at the Dogwood Suite for a presentation by Matt Drury, Resource Management Coordinator, of the Appalachian Trail Conservancy. Matt’s primary responsibilities with ATC are invasive exotic plant control, vegetation management in open areas, and rare plant and phenology monitoring. Meet at the general store to we make our way over to the Smokies and Kephart Prong Trail. Around 8 miles into the Smokies we’ll follow Kephart Prong creek and breath-taking forest setting. On our hike we will see Great Depression era remains from old Civilian Conservation Corps camp. We’ll hike to Kephart Shelter and make our way back. Roughly four-mile hike, in and out. Meet at the Dogwood Suite for a presentation on the celestial bodies, space, and the physical universe by Jim Bakerr, local astronomy enthusiast. Meet at the General Store as we make our way out to Forney’s Creek to the Lakeshore Tunnel. This unique loop takes hikers through a shaded hollow, explores some homestead remains, and makes an unexpected exit through a 1,200-foot tunnel. The loop is approximately 3 miles long, but, those wishing for a shorter hike can take the Tunnel Bypass Trail and shorten their hike by nearly half. Join us in the lodge lobby for an evening of live music by Aaron Tracy of Knoxville, TN. Aaron Tracy can be described as an All-American East Tennessean living his life behind a beat up six-string and a classic stage microphone. If it’s “loud and proud”, wholesome Country Music then it has Aaron’s name written all over it.